There are so many reasons to focus on email marketing for your business, whether it’s a brick and mortar business or a digital one. Let’s discuss some of these reasons so that you can make the most informed choice. It used to be that only huge corporations were able to take advantage of email marketing as a targeted and very affordable form of digital advertising. Now this strategy is available to everyone, from Fortune 100 companies to solopreneurs. With the click of a mouse you are able to get your name, brand, and offerings in front of your prospects and clients. It takes much less time to connect with others via email. Marketing in this way is a shortcut that just makes sense. Using a template for your copy and graphics makes it possible to accomplish in hours what previously took days or weeks. Also, email marketing is all done in real time, so there will never be lag time when it comes to time sensitive offers, sales, and other happenings within your business or industry. You most likely love personalized messages as much as I do, and marketing in this way makes that a simple task. Using the mail merge features of your autoresponder service allows you to include special information within your email messages, such as birthday, login information, and purchase history. This is an amazing feature! You can also segment your database to send them more targeted email marketing campaigns over time. These will convert well and increase your sales because they are so specific. The idea here is to provide them with the most relevant message they are likely to respond to at that point in time. And because these messages are short and to the point, you can communicate with prospects and clients more frequently without additional costs. When I use email marketing with a new niche, part of it includes testing new marketing strategies to see what people are responding to. Because there is no printing or postage costs involved this part of my business is much faster and easier to implement on a regular basis. And forwarding an email that has an enticing or a useful offer or information is only going to take a few seconds. A lot of people will do it if you remind them to share with others who might be interested and benefit from the information. This means that your marketing efforts will not only have a wider reach but people will also begin to act as your brand ambassadors by sharing your information. 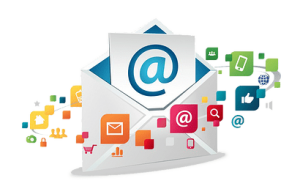 Email marketing can also be done at a low overhead cost. You don’t need to have a lot of employees, marketing analysts or even designers, and many online entrepreneurs do this with only the help of one or two virtual assistants. There are services such as Aweber which will provide you with professionally designed templates that can be changed to suit your needs. An effective marketing campaign will only need a good email marketing platform or service. You can become a skilled marketer who knows how to put the right offers and graphics in front of their community. The return on your investment from email marketing cannot be surpassed. A well thought out and developed email marketing platform will provide you with tracking information on the number of people on your list that opened and email and read it, the number of people who clicked the link in an email, the specific link in the email that was clicked, how many people complained the email was spam, if the email was unsubscribed and if your email reached the recipients inbox. These simple metrics can mean everything to your business success over the years. Finally, using email for your marketing is good for the environment. Cutting down fewer trees is a noble goal and you are making a decision that’s helping the planet while improving your business. It’s a win-win! This entry was posted in Online Marketing Tips and tagged Conversions, Email, Increase, Marketing, Sales on December 16, 2016 by Connie Ragen Green.